In this triangles lesson, we’ll discuss the three different types of triangles. There are equilateral triangles, isosceles triangles, and right triangles. Do you know what it is to be an isosceles, right, and equilateral triangle? Your challenge is to build one isosceles triangle, one right triangle, and one equilateral triangle. 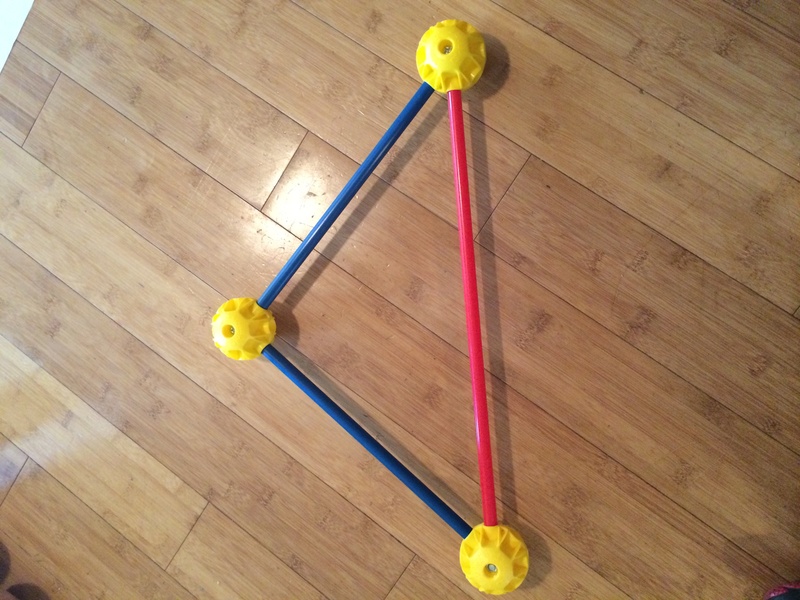 Your child should find that it is not possible to build an equilateral triangle. At this point is a good time to figure out why. See if they can figure out how many degrees should be in each equilateral triangle. Ask them to find two different ways to prove that it is impossible to build equilateral triangle other than just having attempted to do so. Proof one: there are 180° in a triangle. 180° divided by three angles of a triangle equals 60° per angle. There are 360° in a circle. The circular ball has eight different holes. 360÷8 = 45. Because the angles and available are 45 and greater than or equal to 90 it is impossible to build a 60° angle and therefore you cannot build an equilateral triangle. Proof two: we know that two of the points on the ball are 90° apart 90÷2 = 45. And equilateral triangle is made up of 60° in each angle totaling 180 degrees. 60° is not equal to 0°, 45°, or 90° and therefore you cannot build an equilateral triangle.